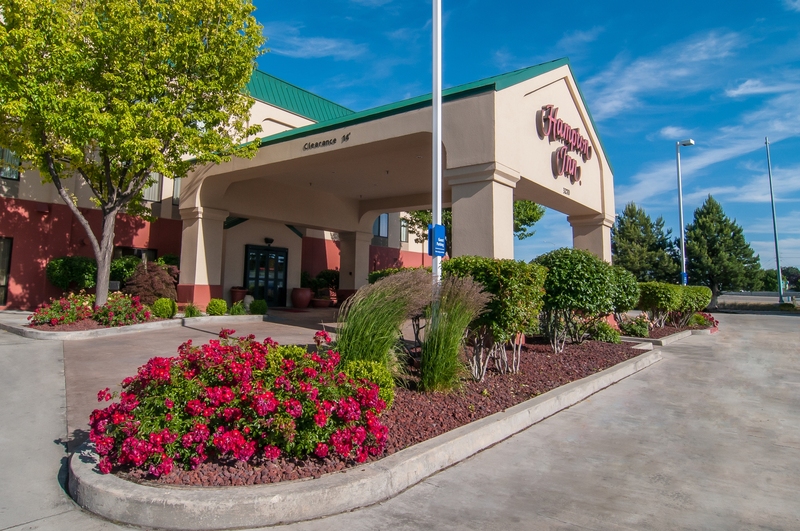 Stay at our Hampton Inn Boise-Airport hotel, less than half a mile from the Boise International Airport and adjacent to Interstate 84. The Hampton Inn Boise-Airport is truly a standout among Boise hotels. Drive less than five miles to popular attractions such as Zoo Boise, downtown shopping, Roaring Springs Water Park and Boise State University, home of the famous blue ‘Smurf’ turf football field. Tour the Boise Art Museum or visit the state capitol. Shop for bargains at the nearby Boise Factory Outlet Mall. Schedule your visit to coincide with the annual Ironman or Professional Golf Association events. Start your work or sightseeing day right with a free hot breakfast in our modern multifunctional lobby. Ask our friendly team members about our free shuttle and things to do in Boise, including popular restaurants nearby. Expect comfortable king- and queen-sized beds, WiFi internet access and a 32-inch LCD TV with HBO® movies. Wake up to fresh coffee from your one-cup coffeemaker, fluffy towels and a WaterPik® showerhead in your bathroom. Relish a midnight snack prepared in your guest room microwave. Upgrade to a King Study room, featuring a sofa bed. Enjoy the comforts of home at our hotel near Boise International Airport.